OMEGA Nutplate Drill Countersinks were given the name because they are used in nutplate pneumatic drill motors. 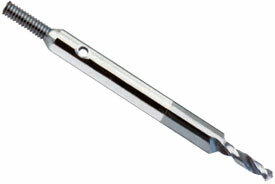 OMEGA Nutplate Drill Countersinks are available in high speed steel or in cobalt. Standard Nutplate Drill Countersinks are made of M7 High Speed Steel and are used for drilling aluminum and mild steel, while M42 Cobalt Nutplate Drill Countersinks are used for drilling hard steel or titanium. These units combine Nutplate Drill Jugs and Nutplate Drills to drill consistent, properly drilled and countersunk holes. OMEGA Nutplate Drill Countersinks are machine specific and are used with Nutplate Jigs to produce a high volume of holes that are to size. OMEGA Nutplate Drills will easily start a hole in difficult to machine materials. The OMEGA NPDS40-100-35 3 1/2'' High Speed Steel Nutplate Drill is one of thousands of quality tooling products available from MRO Tools. Please browse Nutplate Drills for tools similar to the OMEGA NPDS40-100-35 3 1/2'' High Speed Steel Nutplate Drill. OMEGA NPDS40-100-35 3 1/2'' High Speed Steel Nutplate Drill description summary: OMEGA NPDS40-100-35 Nutplate Drill Technical Specifications: Overall Length: 3 1/2'' Body & Countersink Diameter: 0.25 Drill Diameter: 0.0980 'L'' Dimension: 0.420 Material: High Speed Steel Quantity discounts may be available for the OMEGA NPDS40-100-35 3 1/2'' High Speed Steel Nutplate Drill. Please contact MRO Tools for details.